Gates V Belts CLEARANCE. Gates Belts 6224, 3260, 7420, 7350, 7355, 7370, 9319. Lawn Belts. Gates V Belts CLEARANCE PRICED. V Belts for special applications. Gates Belts#'s 6224, 3260, 7420, 7350, 7355, 7370, 9319. Gates Lawn Belts. Gates V Belts CLEARANCE PRICED. V Belts for special applications. Lawn mowers and equipment. Go Kart, Golf Carts, Snowmobiles, and many others. Sale Prices and Stock are subject to change without notice - we recommend ordering extra belts while we have them. Call (574) 267-7522 for ordering assistance. 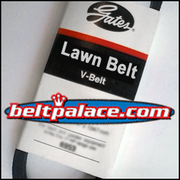 ***OBSOLETE-Contact us for replacement*** Gates 7350 Lawn Belt. Belt 11A0890, Replacement belt for Lawn Equipment. Gates Special Belt 7350. Replacement belt. Gates 7355 Lawn Belt. Belt 10A0900, Replacement belt for Lawn Equipment. Gates Special Belt 7355. Replacement belt. 13/32" top Width x 36-1/8" L. Gates V-belt. Also used in ATVs, Golf Carts, Snowmobiles, and Power Scooters.